The East Indies Tea and Coffee Company is probably the most old-school tea company I have ever dealt with. I have never even heard of them until Marzipan from Steepster offered a group buy of their teas. They so their teas to Della Terra, which is on hiatus until further notice. I am such a sucker for tea names, I figured, why the hell not? Upon steeping the tea, I do get a bit of a sour note from the base black tea. Nothing that makes me want to put down the cup though. I can see this tea being a treat iced, because of the robustness in the cup. The rice crispness of the tea is the show stopper here, the sweet marshmallow and the rice flour richness is quite strong, and I expected no less from this blend. I actually resteeped this too, with interesting results. The sweetness was almost all that was left, and there was little malty note from the tea base/rice crispies. A crazy decadent black tea, great for you dessert lovers out there! Rich and complex charcoal-roasted Tung-Ting oolong tea produces a fruity aroma that is exquisite with the cool mint and rich jasmine. These rolled leaves provide up to 4 infusions. This tea is very interesting. First of all, as a cup of this tea sits before me, it smells amazing. Like intoxicatingly (I don’t know if that was a word before now, but it is one now!) amazing. But with such an enchanting smell … I become a little apprehensive when it comes to taking a sip. What if it’s too perfume-y? After all, it is a perfumed tea. That alone sort of indicates that it might come across as perfume-y tasting. However, it doesn’t. The perfume melds with the buttery creaminess of the Oolong tea to create one of the most unusual yet delightful teas I’ve tasted in a very long time. The Oolong has a slightly roasted back note that seems to tie all the flavors together quite nicely. It’s a very unified taste. That is not to say that the jasmine is not strong, because it is. It is quite strong (this tea is for jasmine lovers only!) and tastes very floral. But it tastes like a natural floral flavor; not a chemical-y, artificial-tasting, lab-recreated perfume. The mint is quite a bit more subtle, but the flavor of it develops as I continue to sip. Similarly, the scent of the mint develops as I continue to smell the tea. The first couple of times I could barely smell the mint, and now it is more prominent, although it is still not as strong as the jasmine. I recommend brewing this in a gaiwan – using short steep times. 30 seconds (or less) for the first infusion; increase by 15 seconds for each subsequent infusion. Any longer and you may wind up with a very strong jasmine taste. If you love jasmine (and I do!) this tea is the ULTIMATE. You really must try it! Formosa Nostalgia Dongding is the modern version dedicated to grandpa’s Dongding Oolong. Strictly following traditional Dongding Oolong process, our Nostalgia Dongding is hand roasted, produces full bodied long lasting fruity aroma. 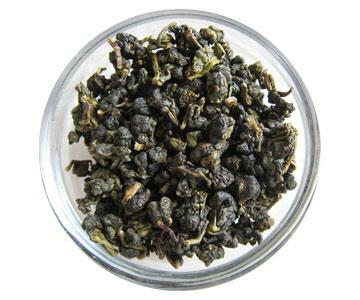 This is the best choice if you are looking for retro style Dongding Oolong. This Oolong is a little different than I’m used to, but in this case, different is definitely a good thing! There is a bit of spiciness to the sip that I do not usually associate with Oolong tea, as well as a bitter note. This bitter note is not an offensive or off-putting bitter taste, but a savory one that provides a nice contrast to the sweet qualities of the cup and compliments the overall flavor profile of the tea. The mouthfeel is smooth and slick. A light astringency does not allow the mouthfeel to linger, leaving a very clean aftertaste. The sweet, nutty quality of this tea is enhanced by the toasty essence of this hand roasted tea. There is also a fruity note that is peach-like in the background. A pleasant, full-flavored Oolong that I’m very glad I had the opportunity to try!